As Director of Education, Michael has led the way in redefining the Religious School experience for TBE members. He has created a passionate and inspirational vision of what a Congregational School and Congregational education can look like, and has translated that into powerful learning experiences for children and families. Michael's attention to relationship is paired with an ability to use technology, including using Facebook to bring trips to Israel alive for the whole congregation and creating YouTube videos to teach the weekly Torah portion. Michael “brings a contagious enthusiasm and 'outside the box' spirit” to TBE. The result is an entirely new model of learning that has increased student literacy, garnered more family involvement and increased membership at the congregation. Through her work as a Judaic Studies teacher, Rivke uses technology to create a link between the historical implications of text and the modern world that our students are confronted with daily. She uses technology to create lessons that engage students and encourage them to become active participants in the learning process. Rivke took it upon herself to become the WHHS technology staff consultant, changing the whole school culture, and to submit 77 top-notch Smartboard lessons to the Legacy Heritage Fund which spreads her work throughout the rest of the field. Rivke is also an active member of the DigitalJLearning network which support online learning in Jewish classrooms (a joint program of The Jewish Education Project, JESNA and The AviChai Foundation). Rivke’s lessons bridge thousands of years of history and bring the messages of the text to life in a way that is concrete, entertaining, and impactful. Jacqueline’s role at the JCC Manhattan transcends from the Nursery school on and leverages on the interpersonal attention needed for each age group. Jacqueline’s expertise lies in documentation, and in sharing studentthe learning that takes place happening in the classroom with parents to connect them to the Jewish experiences in the early childhood program. She is a master at capturing and sharing the wonder and discovery of learning with children, families and colleagues. Jacqueline’s enthusiasm for experimentation is infectious , and her work in this area is now being replicated throughout the institution. Through her work in and out of the classroom, Jacqueline is changing the landscape of family engagement. Yoni is the Founding Director of Eden Village Camp, the only Jewish farm or "Green Dream" of Jewish camp. Eden Village is the only camp that grows and serves organic, local, homemade gourmet food and maintains a holistic and integrative perspective. The camp has succeeded in drawing a cross-section segment of the Jewish population, including Reform, Conservative, Modern Orthodox, Renewal, and Reconstructionist Jews, many who had previously been choosing secular camps. Yoni starts with the learners interests - in animals, art, organic cooking, or natural science - and brings Jewish context, values and rich experiences to those areas. Alison has successfully impacted the teens at her synagogue by keeping them involved in Jewish learning and in leadership roles post Bar and Bat Mitzvah. By developing innovative programs such as alternative seders, service-learning overnights in New York City and teen lobbying trips to Albany, she has empowered the congregation’s youth to grow in character and confidence and to remain connected to the Temple community. Through her efforts, high school enrollment has become the “thing to do” and grown to over 115 students. 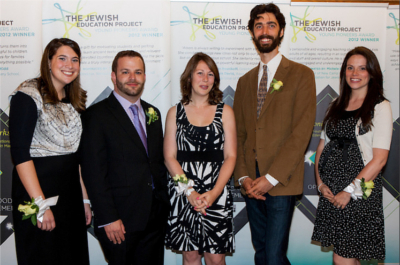 Alison is currently an active participant in The Jewish Education Project Long Island Jewish Teen Directors Network. These bios reflect the work of the recipients at the time of the award.